Generally when I start a review, I discuss the book, the plot, the writing, and then launch into the narration and my impressions. But this book and this performance was a masterpiece of suspense, drama, passion, and a superior performance by Moira Quirk. So this time, I am starting with the performance. voices are crisp and distinct. Her male characters range f rom a rasp (the demonic f allen Angel), a southern drawl (Lucien Stone), to the sardonic tones of the main male character, Jack Talent. No missteps, no gaps – only the slow building of tension (both mystery and romantic). When I’m reading the book I’m looking for its tone and how that might change. I’m noting the characters and their traits and whatever arc they might have. I cast the book in my head like I might a play. I’ve been a voice over artist for many years now, and I think all of us travel with a repertory company in our heads, and so I pull out my readily available characters and create my new characters to build my ensemble. For fans of steampunk, (and in) the romance realm, the third installment of Kristen Callihan’s Darkest London series has just been released, Winterblaze. Did I say yet how mind-blowing it was to discover all these subsets of romance? The Darkest London series is paranormal romance, and so far has followed three sisters with highly unusual “gifts.” Miss Kristen has devised some intricate lore, and some diverse characters! Shadowdance is book four of a series and, as I mentioned above, this world is complicated. It will be a richer experience for audio listeners to start with Book 1 of the Darkest London series, Firelight. It had been a while since I had plunged into this world, and re-entry came back to me slowly. Supernaturals, of which Mary and Jack are two agents), and the NEX, an organization of demons (which includes Will Thorne). Jack has been hiding secrets for all of his 26 years, and even more so after surviving torture and blood-draining at the hands of the Nex association of demons.And the one woman who he was attracted to, Mary Chase, was the very one that witnessed his humiliation and rescued him from his crucifixion at hands of the demons. Jack’s past, his blackmail by Mary’s protector and fellow-GIM Lucien Stone, and his thirst for revenge drive him to keep Mary at arm’s length with years of verbal sparring and derision. Mary, who feels the same attraction, has responded with sturdy walls of competence and antipathy, until they are forced in unwilling partnership to catch the killer known as the Bishop of Charing Cross.And the closer Mary gets to the truth, the more Jack sells his soul to keep her innocence intact. I loved Kristen Callihan when I f irst read Firelight a f ew years ago. Her books are ref reshingly different and defy genre. The world she has created allows for some really interesting plot twists and gives new lif e (no GIM pun intended) to arcs around suf f ering, redemption, and love. She can make you smile after wrenching your heart, and some of the best parts of this audiobook are the verbal exchanges between Jack Talent and Mary Chase.And the intonations by Moira Quirk bring this to life. This was one of those audiobooks that left me with emotions that I had to put away after leaving my car. I was distracted as I wondered if Mary would find out Jack’s secrets. I was interested to see where the small subplots with the inventor Holly Evernight would lead (answer, the next book). I was almost as irritable as Mary as I waited f or some relief f rom the passionate tension between Jack and Mary (which may be the longest mating dance ever – it actually spanned three books). Never once was I conscious of an author and a narrator; I only wanted to get back to the mysteries of Jack and Mary. Great bo o k and great perf o rmance. 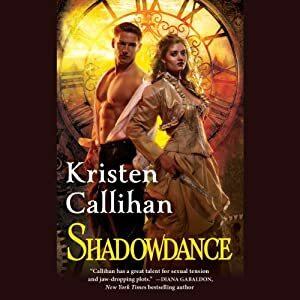 Shadowdance was provided to AudioGals for review by Hachette Audio. ← Jeeves but no Bertie? Eh what? !